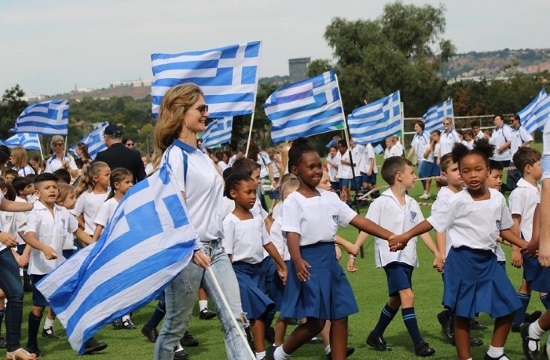 The Hellenic Federation of South Africa on Monday commemorated the 25th of March in 1821, which marks the day Greece regained its independence from the rule of the Ottoman Empire, according to greekreporter.com. Festive celebrations took place at the Greek SAHETI School, on the eastern outskirts of Johannesburg, where pupils participated in the Federation’s program featuring music, folk dancing and a traditional march. The SAHETI School was founded in 1974 by a group of founders under the leadership of advocate George Bizos, a human rights lawyer who campaigned against apartheid in South Africa. Its doors were open to everybody, welcoming widely diverse communities to share in its values-driven, universal education. Currently, the SAHETI School is an English-medium, independent school dedicated to the pursuit of excellence, while it still promotes the ethos and values of Hellenism. The insightful motto “Know Thyself,” founded in ancient Greek thought, is at the core of the school’s ethos.